The MEM Industrial trade show, which closed its gates in Mexico City’s Centro Citibanamex convention center on January 18, underscored its reputation as a business platform that delivers for international exhibitors and visitors alike. “Our successful partnership with AMPIMM, the Mexican Association of Wood Industry Suppliers, has given the show a new face and effectively transformed it into a one-stop shop. We have succeeded in turning MEM Industrial into Mexico’s leading industry showcase,” commented Christian Pfeiffer, Deutsche Messe’s Global Director LIGNA & Woodworking Events. 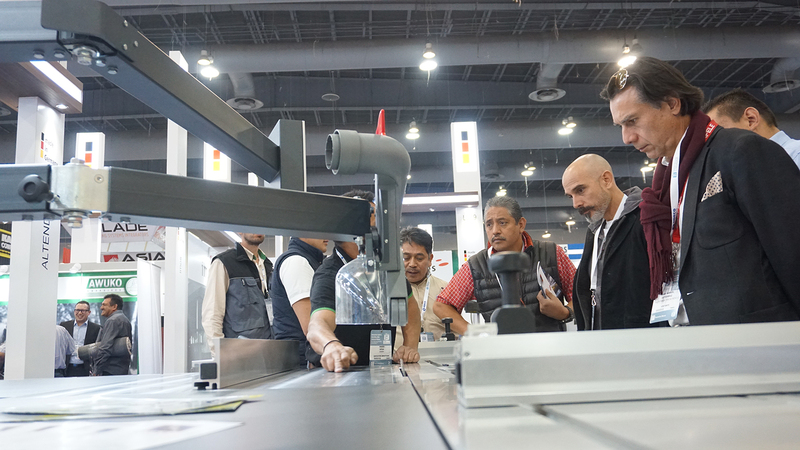 “This year’s show put the spotlight on machines and accessories and featured a high-caliber conference program.” Over 130 companies and 230 brands from Mexico and around the world exhibited their latest products and solutions on over 10,000 square meters (107,640 sq.ft.) of space. 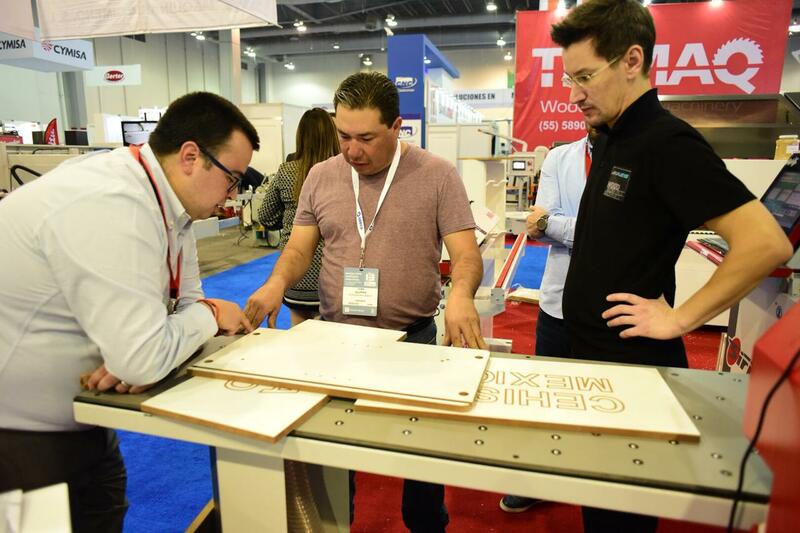 Over 30 percent of exhibitors at Mexico’s leading trade show for the woodworking and timber processing industries came from outside Mexico, including from countries like Germany, Italy, Brazil, Spain, China, Taiwan, Columbia and the USA. MEM Industrial’s comprehensive exhibition offering includes woodworking machinery, tools and equipment for custom and mass production, fittings, accessories, materials and panel product and sawmill technology. Germany’s national pavilion, which was aptly themed “Made in Germany”, featured a particularly high concentration of cutting-edge technologies as well as key technology trends. It featured exhibits by leading German companies and organizations, including Altendorf, Awuko, Kaeser Kompressoren, the German Forestry Council (KFW), imos AG, Schmalz, Serra, Tigra and Venjakob. China’s national pavilion also featured high-tech machines and applications from a number of companies, including Tiantai Tianmeida Machinery Co., Ltd and Linyl Lvran Decorative Material Co., Ltd. 2019 marked the second time that China has been represented at MEM Industrial with a national pavilion. Another highlight was the first-ever University Design pavilion, which was themed “eco & smart” and showcased young Mexican design talent. Industrial and interior design students and graduates from Mexico’s most respected universities used the pavilion to present their design projects and network with industry professionals. MEM Industrial’s supporting conference program featured top-notch speakers and a series of lectures and training seminars on the latest trends, developments and innovations in the wood and furniture industries. International experts explained the pathway from CNC processing to fully integrated digital factories as well as the latest trends and technologies. During the panel session on day one of the show, experts discussed a variety of topics, including sustainable marketing of wood products. Since many of the speakers came from outside Mexico, attendees were exposed to a wide range of new processes and solutions. They also learned how industry 4.0 technologies are giving manufacturers access to new market opportunities and boosting their global competitiveness. The 25th MEM Industrial trade show was supported by the Mexican Association of Wood Industry Suppliers (AMPIMM), the European Federation of Woodworking Machinery Manufacturers (Eumabois) and the German Woodworking Machinery Manufacturers’ Association within the German Engineering Federation (VDMA). The next MEM Industrial will run from January 22 to 24, 2020 at the Centro Citibanamex convention center in Mexico City.